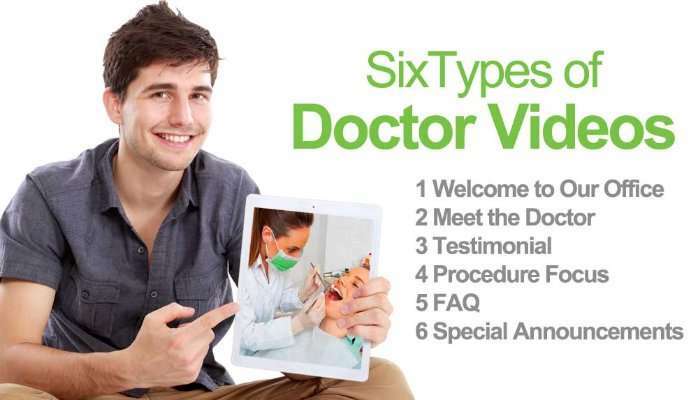 “Meet the Doctor” – This video is a perfect way to introduce yourself to new patients. Focused on you, your background and what makes you unique, it gives new patients a glimpse into your personality and passion for how you can help them. “Patient Testimonial” – There is power in an authentic patient testimonial from a real person about their real experience in your care. We interview former patients and have them talk about what they liked about having you as their doctor. People love to watch a great testimonial! “Procedure Focus” – Explaining a medical procedure is usually best done with visuals. With this video you can describe a procedure in more detail and address patient’s questions and concerns about all aspects of the procedure. “FAQ” – Great for doctors who want to help new clients feel more comfortable about the care you will provide them. Answer questions that most new patients ask about your practice or address general questions about how to take care of themselves after a procedure. “Special Announcements and Promotions” – Do you want to get the word about something new you are offering? This video is great for generating buzz and interest in a new piece of equipment you use, a new associate in your practice or a special seasonal discount. Chuck Wilson and his wife Christie work with doctors all over the country to create great videos to promote their practices. They work with Plastic Surgeons, Dentists, Chiropractors, Orthopedic Surgeons, Bariatric Surgeons, Dermatologists, Vascular Surgeons, Orthodontists, Podiatrists and more.